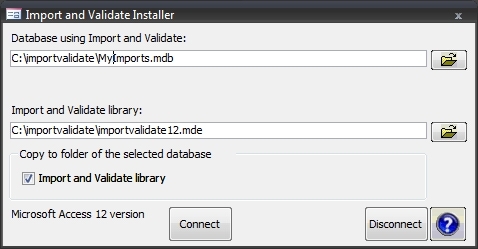 Use this program to make Import an Validate / Excel Import available in your (Import) database. Select the database you want to make Import an Validate available in. Select the Import and Validate library (importvalidate? ?.mde, preselected). You can either have the original Import and Validate library file referenced, or you can reference a copy. The latter may be easier when you want to distribute the database and the import library to other locations (maybe other machines).